Up to the present time, Aki Ozawa has had a lots of collaborative experiences on various fields and participated in a great variety of musicians’ concerts and recordings. At the end of teens, he went and stayed in the United States and collaborated with Bill Ficca (from TELEVISION), Howie Wyeth (who played with Bob Dylan as a backing band member), and many highly experienced musicians. After coming back Japan, Aki formed a band BYFAL and make wide range of activities with his band. His flexibility and skills allow him to work on many fields such as Jazz, Pops, Avant-garde, Flamenco, providing pieces, and so on. Especially, Aki’s accompaniment to singing is deeply put faith by musicians, supporting vocalists on various fields. For example, He has played with Miyuki Ishibashi who is singing songs of Russian outcastes as a reader of her band and he produced Satoko Nishikawa’s (from Shang Shang Typhoon) solo album ~hibiki~. In a duo with a bandoneon player Kaori Okubo, his strong focus on Latin American music is expressed clearly. 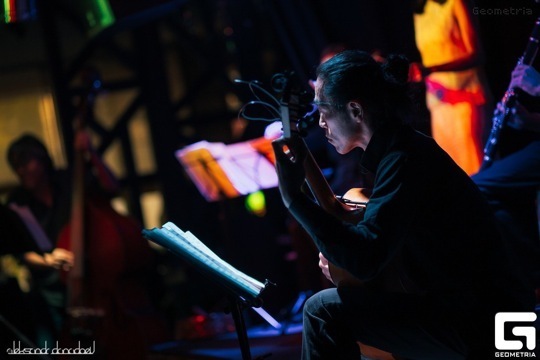 In monthly solo live, Aki plays his original pieces and Spanish and Armenian folk songs which are uniquely reinterpreted for solo guitar performance. Through his guitar, he has hybridly pursued ways in which music exist and change at present time. In other kind of work, Aki produce a series of silent movie project, also playing as a backing musician in these projective performances at The National Museum of Modern Art Film Centre, Tokyo over 10 years. This project musically produced by Aki has shown not only Japanese films but also abroad pieces for audiences. Until now, this project has featured Chaplin, Keaton, and Lloyd――called the three greatest king of comedy, Yasujiro Ozu’s films, and old films newly found recent years.